I had a really interesting day, today. First, I drove to Southern San Diego County for Fat Quarter Club, at Cozy Quilt. I got a free pattern for the above quilt, it's called Mirror, Mirror. Isn't it delightful. Before Fat Quarter Club I chatted with a great gal, we talked about our 14 year old grandsons, who are both very athletic. She was a amazed that I live in Murrieta and drive the long distance for this event. I told her that a fellow blogger, had told me about it, and I come about 1/2 of the time. She asked for my blog info, and then said she already reads this blog. I was really surprised. Small world. Next on my agenda, today is the start of the San Diego County Quilters Row Quilt Run; now, that's a mouthful. I'd never done a quilt run and decided 8 shops was manageable. The Run last until next Saturday, but I decided to do them all today. I started at Cozy, the southern most shop and worked my way home. It was a great deal of fun, and I'm sure glad I have my Garmin GPS! I was all over, and traveled a lot of back-roads with ease. I saw a lot of wonderful scenery, and a camel, but there weren't great places to pull over when I wanted to, so no scenic photos. This is the PR on the Row Quilt Run: During the event days, visit any (or ALL) of the listed shops to receive a FREE pattern. Each shop will give away directions to make a different row … Put them all together and you can make a terrific quilt measuring about 60" x 72"! I was extremely happy with two of the patterns; marginally happy with two; and four were no go's. It's all personal taste, of course. At one of the no go shops, they were doing a presentation on a new release quilt pattern and it was great. Would I do this again, you betcha! I love to drive and have fun! Sounds like you had a wonderful day. Glad you could make it to Fat Quarters. 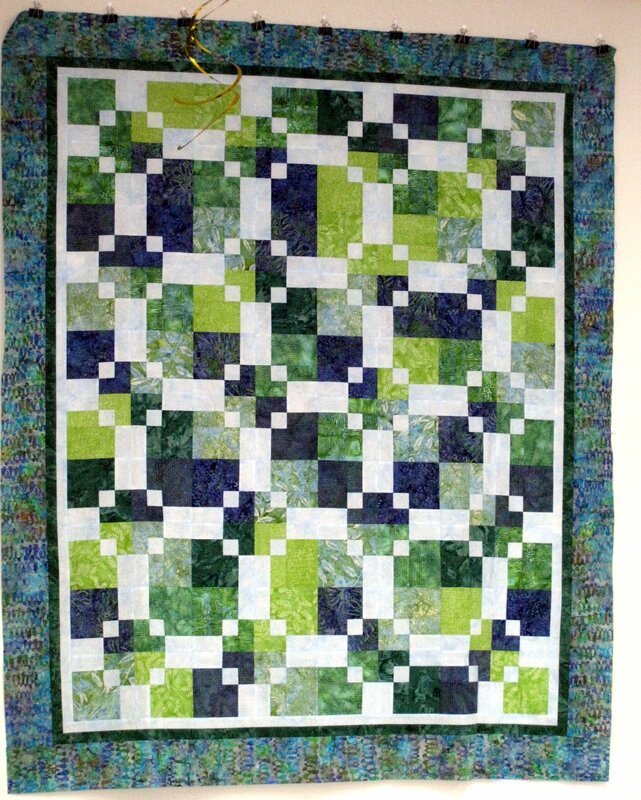 Quilt looks beautiful. Sadly, I wasn't able to make it. Are you going to be able to go on the So. Cal. Quilt run in June?